Speaking to Russian media, a couple from Deir ez-Zor, the eastern Syrian city which held out for three long years against Daesh, described a story of suffering, resilience and heroism often chillingly reminiscent to that of WWII-era Leningrad. Last week, Syrian forces backed by Russian airpower broke through Daesh lines in eastern Syria and linked up with allied units in Deir ez-Zor, breaking the terrorists' brutal three-year-long siege of the city. 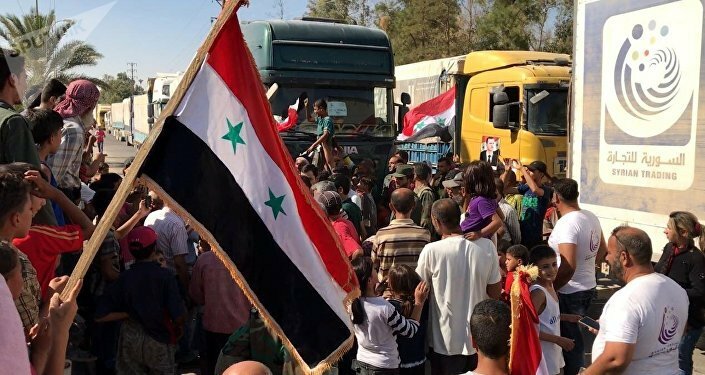 Russia immediately began sending humanitarian convoys into the city, delivering much needed food, water and medical supplies to the local population, and sending sappers in to clear the area of enemy mines, booby-traps and unexploded shells. Meanwhile, reports have begun trickling in from Deir ez-Zor about the hellish conditions its residents lived through in order to stand firm against Daesh, which chose a strategy of shelling and starving the city into submission which bore a surprising resemblance to what Hitler tried to do to Leningrad in 1941 during the Great Patriotic War. Reporting out of Syria, RIA Novosti correspondent Dmitri Vinogradov interviewed Irina and Ibrahim Assaf, a Russian-Syrian couple who have lived with their family in Deir ez-Zor for decades, and who have experienced the senseless brutality of the jihadists firsthand. Irina, a Russian-born biologist, met her husband, a doctor in Agronomy, in university. They moved to Deir ez-Zor, Ibrahim's hometown, in 1994, and had three children – two boys and a girl. The couple was unable to imagine the fate that would await them. "People died from shelling, from hunger, especially children and the elderly," Irina said, describing life in the besieged city. "The city's cats and dogs disappeared: they were simply eaten," she added, her words eerily reminiscent of historical accounts of the first months of the Leningrad Siege. In fact, for readers who are familiar with that tragic event, much of the Assafs' story may sound familiar. 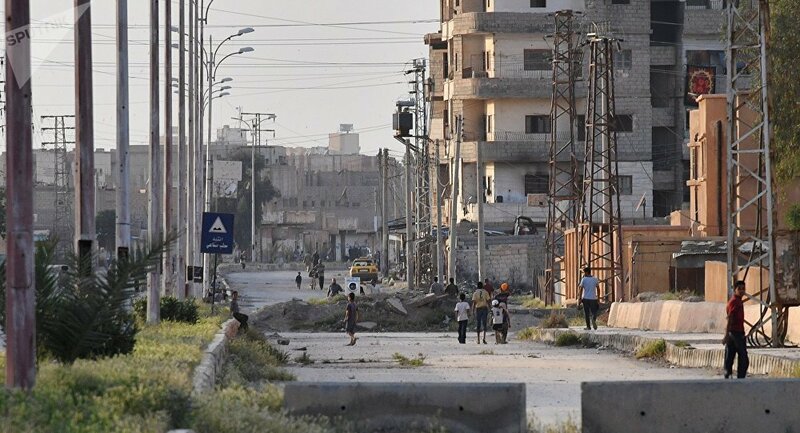 "The weather conditions in Deir ez-Zor are very difficult; in the summer it is dry and hot. If there is no water, it's just insufferable," Irina explained. "The water was turned off (city workers could not continue to operate the water pipeline while under fire), and people would die of thirst," she added. "There is a river nearby, and it's possible to bring water [by hand], but the militants would fire on the shore. They didn't even let us take water from the river," the survivor recalled. Irina and Ibrahim recounted that many of their friends and neighbors were either killed or injured by enemy bullets, bombs and mines, or simply disappeared without a trace. "My cousin's wife died from a mine which the militants had planted; my friend's wife was killed; our neighbors were killed, another neighbor's father was killed, my father was injured," Ibrhim said, listing the losses. "We were constantly under fire. It's all a matter of luck [whether one gets hit or not]. Our district was under constant bombardment, and if you peeked out…"
"And there are many more people whose fate we don't know…they simply disappeared. Are they alive? What happened to them?" Ibrahim asked. Irina recalled one incident which stuck out in her mind. With a biology degree, she had a reputation with neighbors as someone who was knowledgeable. One day, she was asked to take a look at the wounds of an old man who was in pain after being hit by a militant mortar shell. There were not enough doctors in the city, and residents turned to one another for first aid. Irina had to make her way through several blocks under fire. "The wound didn't seem to be that bad, but he was an old man and had diabetes. I came, it was very dark, nighttime. There was no electricity. In the dark, under the dim light of a candle, I examined him. The wound turned out to be deep, dangerously deep. I had some bandages and peroxide with me, but when I began working on the wound, I realized only a surgeon or even amputation could help him. I said that he should be taken to hospital as soon as possible," Irina said. The elderly man didn't make it. During the siege, city hospitals were filled with wounded soldiers. The medical help he received was not sufficient, and after several days he died from gangrene. Irina and her family were more fortunate. They were able to escape the besieged city. At that time, the blockade was only beginning, and Daesh was not yet fully in control of all the roads out of the city, and it was possible to take the risk to try and get out. "The situation was becoming catastrophic. There was a danger that upon entering the city, the militants would simply kill everybody, not to mention me as a Russian," Irina recalled. "After the Russian vetoes [between 2011 and 2014, Russia and China vetoed several Security Council resolutions on Syria] these militants were dead set against Russia; this was no secret. So we decided to leave." The Assafs left Deir ez-Zor at literally the last moment, taking only their documents and a few possessions with them. They faced a treacherous journey, passing through five Daesh roadblocks. Irina and her 18-year-old daughter covered themselves from head to toe in hijabs, hiding their Slavic faces and pale skin. Escaping was literally "a matter of luck," Irina said, and depended entirely on who was manning the checkpoint. "For any trifle, even the slightest suspicion, one could be shot, taken prisoner, or enslaved." Irina said she was shocked by the militants' appearance. "There were many foreigners, some of them looked like Afghanis or Pakistanis. They looked like they were from another world –as if they were hallucinating. No concept of cleanliness, of appearance. They were very dirty, camped out in the desert; what kinds of supplies could there be to speak of? What kind of water?" The tensest moment of the journey was when one of the terrorists found the Assafs' bag of documents. "He opened the papers, finding a copy of my Russian passport. 'That's it, it's all over,' we thought. These were our last moments. But apparently, he was illiterate and didn't understand what kinds of documents these were or in what language they were written. My husband said it was a copy of a university diploma. Suddenly someone distracted the fighter…We quickly packed everything up, and he ordered us to leave." Those few seconds seemed like hours, Irina recalled. "It was just God's will," she said, explaining the family's miraculous survival. The Assafs traveled west to safety, eventually settling with friends in a small village near Latakia. Ibrahim works as a teacher, Irina gives private lessons in biology and Russian. Irina keeps in touch with a few friends who have remained in Deir ez-Zor, the city which has become so dear to her. She communicates with one 24-year-old woman via text messages, because cellular communication is poor and there is no internet. "I regret that I cannot help her. Supplies are poor. Prices are 10-20 times higher than in the rest of Syria. A lot of people have died from hunger, from diseases, from wounds and from epidemics, because there is no medical assistance. Daesh shelling never stopped; the militants used both conventional weapons and self-made ones to try and strangle the population…" she said. Irina is also glad that Russia, her motherland, is helping Syria militarily and with humanitarian assistance. "People here need help," she pleaded. "There is an Arab proverb that says that 'homes keep secrets'. All sorts of problems are hidden within the walls of peoples' homes [in Deir ez-Zor]. They do not make a display of their problems, but the standard of living has fallen very sharply, so even the smallest help is important. After all, this is an indication of sympathy and support." Now, with the blockade finally broken, and the first humanitarian caravans starting to arrive, Irina, Ibrahim and their fellow countrymen and women hope that peace will return to their city, and that they will be able to return home.